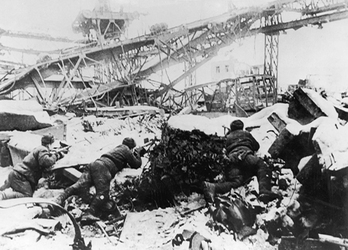 The division first saw action in September 1942, when it was sent to Stalingrad, where it assigned to defend the Red October (Krasny Oktjabr) Steelworks factory. Fierce battles raged around and within the factory for months. Although heavily outnumbered, the division managed to ward off German troops trying to take full control over the factory. eventually led to a shortage of troops to defend their flanks. On February 2nd 1943, the 6th Army became the first German field army to surrender. 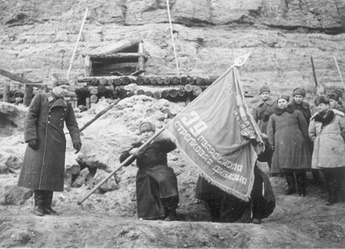 After the heroic defense of Stalingrad, the 39th Rifles Division received the honorific ‘’Guards’’ title as an acknowledgement of its bravery and perseverance. It became part of the new 8th Army and served in Ukraine, helping to liberate the Don Basin. In early 1944, the 39th continued fighting across Ukraine and took part in the liberation of Nikolayev and Odessa. In summer, it operated in Moldavia and crossed into Poland, liberating Lublin and establishing an important bridgehead on the Vistula. This would be instrumental for the further advance towards the German border. In the last year of the war, the 39th took part in the Vistula-Oder offensive. In just 23 days, the division advanced 500 kilometres through Poland, liberating Poznan and Lodz. On special orders by Stalin, the 8th army (including the 39th Guards Rifle Division) became part of the 1st Belorussian Front under command of Marshal Zhukov. Never one to underestimate the power of symbolism, Stalin wanted the divisions that had been part of the Battle of Stalingrad to play in instrumental role in the eventual Battle of Berlin. On March 11th, Kustrin Fortress – just 60km from Berlin – was successfully stormed, establishing a bridgehead over the river Oder. The advance on Berlin continued from the east, where the 39th Guards would eventually cross Karlshorst, Tempelhof Airport and Tiergarten to end their war in the very heart of Berlin, at the Brandenburg Gate.